Aladdin Lamps Deluxe Glass Hanging Lamp, Brown w/ 14 Opal Slant Shade, #BH815-716 Brand New In Original Factory Box. Our Deluxe Glass Hanging Lamp brings a disctinctive touch of country charm to any home. With its stylish stippled-finish brown glass bowl, solid brass frame, and 14 Opal White Shade, this lamp fits easily into any early American decor. The disctinctive tilt frame hanger makes it easy to remove for refilling. The warm, friendly glow from this Aladdin lamp will provide countless nighttime hours of tranquillity, reminiscent of a more peaceful, simple time. Lamp can double as a shelf or table lamp. 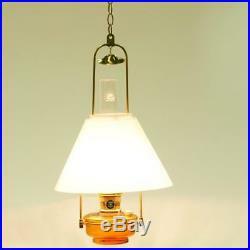 24" overall height (plus 18" brass chain included), 7 lamp base diameter, 1 quart kerosene capacity. This lamp needs a minimum clearance of 12 from the top of the chimney to the ceiling. Comes with Aladdin MaxBrite 501 burner: Simply put, the new MaxBrite 500 Kerosene Mantle Lamp burner from Aladdin Lamps is the most efficient and brightest burner created by Aladdin. Using the knowledge gained over the last 100 years of producing bright, white light from the unique mantle and round wick burners, paired with precise tooling and engineering available today, Aladdin Kerosene Mantle Lamp Company has created the MaxBrite 500. Aladdin Lamps produces 60 watts of bright, white light without smoke or odor. The unique round wick and mantle combination of the burner provides you with a steady, bright white light making it an ideal choice for power outages or off the grid living. The Aladdin Lamp uses K-1 kerosene, which is economical and easy to find. A quart of kerosene will provide you with approximately 12 hours of light. The Maxbrite 501 burner also produces around 2,000 BTUs per hour, providing heat as well. Choosing Electric or Kerosene for your Aladdin Lamp: We offer all of our Aladdin Lamps with the option of electric or kerosene. The kerosene burner produces a wonderful, safe, bright white light for non-electric situations such as power outages. The Aladdin Lamps have been in use since 1908. Electric Burners (also referred to as converters) use the same burner body as the kerosene burners to acheive the same look as kerosene. The design of the electric burner keeps all of the wiring within the burner and a turn-knob replaces the wick raiser. The gallery also has the same look, but is not interchangeable with the kerosene gallery. The Aladdin Chimney also fits the electric burner. The electric burner is designed so you can keep your lamp font (base) full of kerosene if you choose, and have it ready for power outages, while using your lamp on a daily basis as an electric lamp. WARNING Using this product can expose you to chemicals including lead which is known to the state of California to cause cancer, and carbon monoxide, which is known to the state of California to cause developmental toxicity. By default, this lamp ships with a kerosene burner. The item "Aladdin Lamps Deluxe Glass Hanging Lamp, Brown with 14 Opal Shade, #BH815-716" is in sale since Wednesday, August 22, 2018.